You are here: Home / Beach Bound / Florida Beach Vacation, Elevated! With fall just around the corner, it’s prime time to book a much-needed getaway to Florida’s Emerald Coast. After Labor Day, the rates go down, and there are far fewer crowds, but the weather is still perfect. 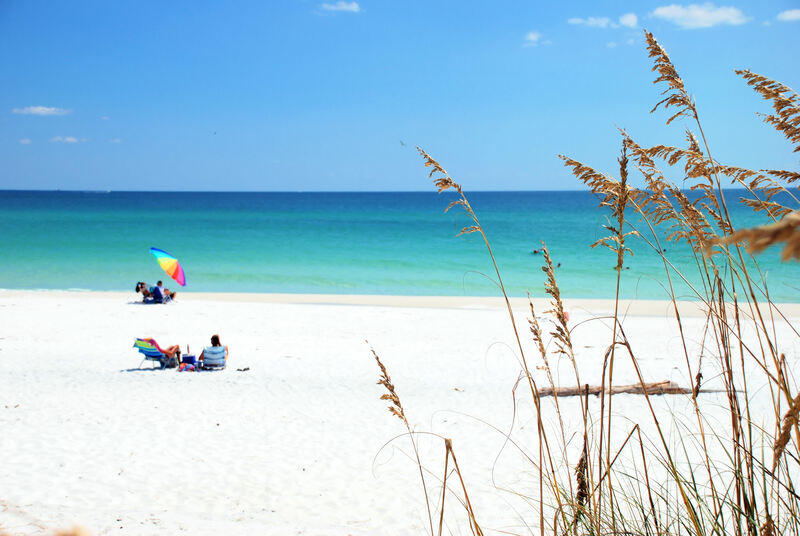 The area, which encompasses Destin, Fort Walton Beach and Okaloosa Island, is known for its brilliant emerald-green waters and sugar-white sand beaches. It’s the closest thing you’ll find to paradise in the United States, short of booking a flight to Hawaii. Good Morning America has named this area one of the “10 Most Beautiful Places in America,” but there’s much more to this beach destination than gorgeous scenery. Here’s a list of the top 15 must-try experiences while you’re there. 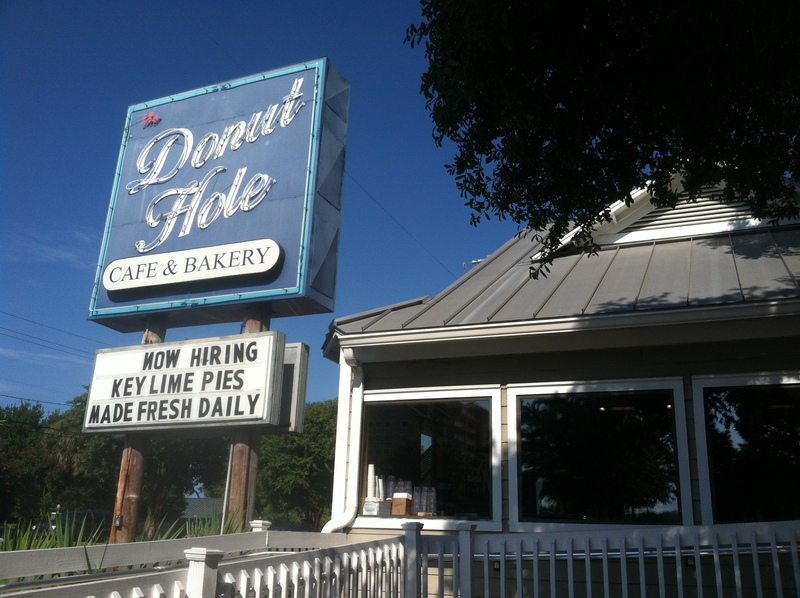 The Donut Hole is a breakfast hot spot, popular with locals and visitors alike. There’s a reason that there’s a line out the door at the Donut Hole Bakery Café . This must-try breakfast haunt in Destin features an array of fresh-baked doughnuts (with flavors ranging from devil’s food cake to key lime cream-filled), plus hearty fare (like thick maple bacon and Gulf Coast crabcake Benedict). This is the place to go for a sit-down meal combined with great service and a huge menu selection. Another breakfast option is Asiago Skillet, located in Fort Walton Beach. This quaint outpost offers a variety of dishes—from the indulgent to the health-minded. For something substantial, try the Bagle Boy Bull’s Eye, which features a perfectly cooked egg inside of the bagel’s hole. My travel companions also raged about the seafood skillet. If you’re watching calories to maintain that beach bod, opt for the egg-white omelet. It comes stuffed with a ton of veggies, so you can feel good about having dessert later in the day. They’re also open from midnight to noon, so it’s a great option for late-night munchies. 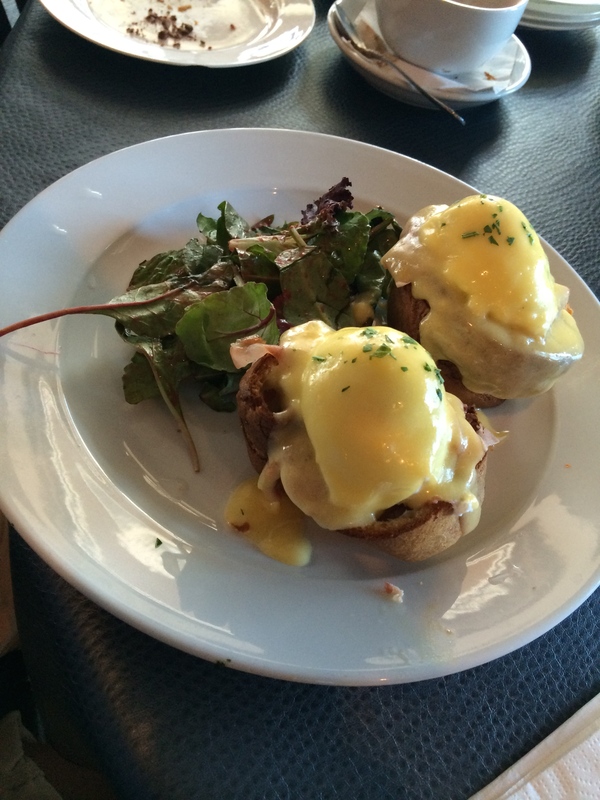 The eggs Benedict at Mama Clemenza’s can’t be beat. If you’d rather spend some early-morning time on the beach, then save your appetite for brunch at Mama Clemenza’s. This somewhat secret resto (it’s popular with locals, but visitors have to know what they’re looking for) has won numerous awards for its European-inspired cuisine. Although it’s located in a strip center, the quality of the cuisine surprises. Absolutely everything is made in-house, and we were treated to Italian madeleines steeped in honey and Sicilian flourless espresso biscuits. While all of the menu items enticed, I had to try the homemade eggs Benedict. Two perfectly poached eggs sat atop thick-sliced proscuitto and Yorkshire pudding muffins (yes, you read that right! ), and were slathered in creamy hollandaise sauce. The tossed green salad with raspberry vinaigrette made me feel slightly less guilty about the utter decadence of this dish. The packed-out restaurant also has a back room where cooking classes are held. For some much-needed exercise, be sure to try stand-up paddleboarding lessons with GUSU Paddlesports. This water sports-gear mecca supplies all the necessary equipment, and, right now, they are offering a special promo where you have your photo taken at their shop for a chance to win a new paddleboard. This hot fitness trend is just that much better with occasional dolphin sitings and gorgeous views of the Gulf of Mexico. 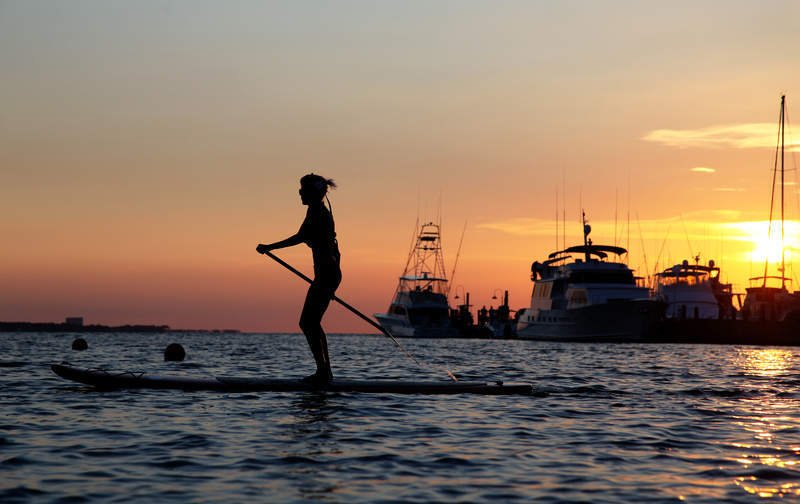 It’s such an amazing place for paddleboarding, in fact, that paddleboard enthusiasts flock to the area for annual events, such as Destin’s SUP Cup. And, paddleboarding is easier than it looks because it floats more like a boat than a surfboard. You’ll start off in the heart of HarborWalk Village, and then learn the necessary skills while paddling in Destin Harbor. When you need to cool off, just dive right in! Another option for outdoor pursuits is Norriego Point. This public-beach access area features a small finger jetty with shallow water that’s perfect for snorkeling or just wading around while enjoying the more natural side of the coast. You can get there by paddleboarding or jet-skiing across the harbor, or you can take a car to an entrance point on Gulf Shore Drive. 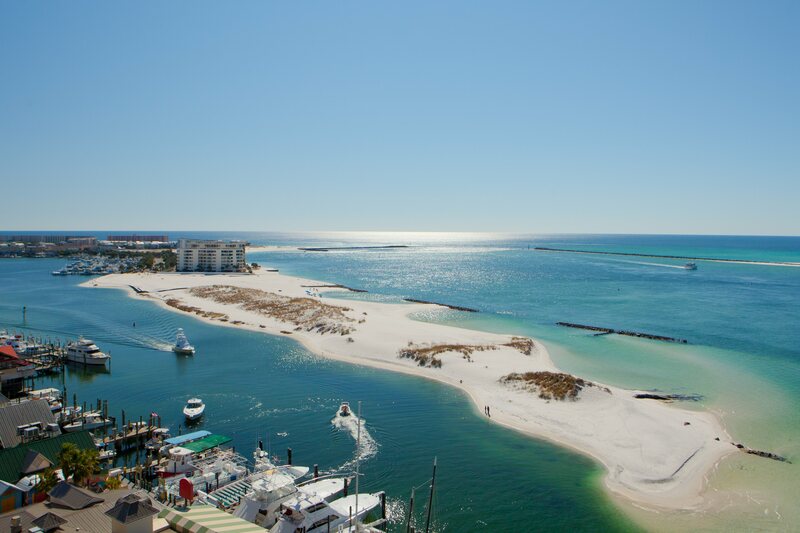 It’s an iconic location, because it is the focal point of beauty in Destin Harbor—and it can easily be seen from anywhere around. The underdeveloped and natural locale also has a serene stretch of pristine sandy beaches where you can watch the boats come return from the Gulf. 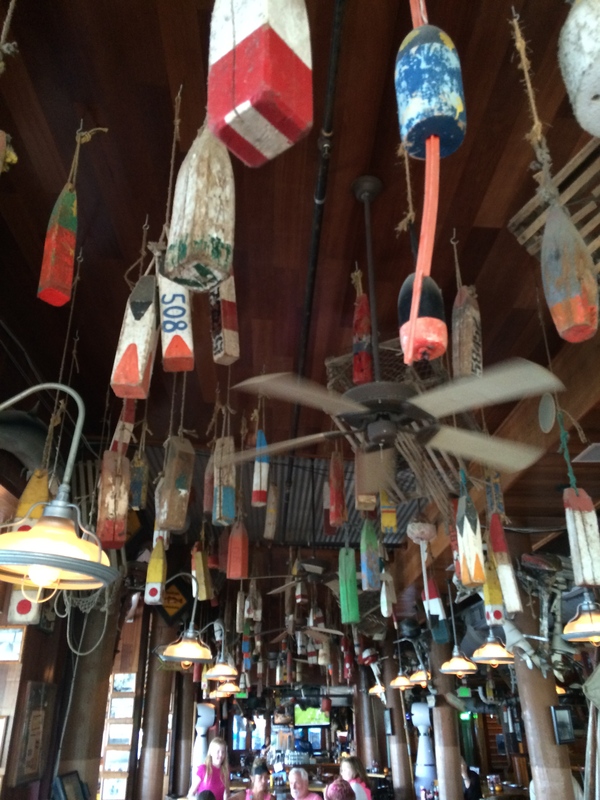 Antique buoys hang from the ceiling at AJ’s. Next up, grab a spot on AJ’s Seafood & Oyster Bar‘s sprawling deck, overlooking the harbor with a cool drink in hand. I suggest ordering the Jack Monkey cocktail—it’s a concoction of rum, banana liqueur and a hint of Jack Daniels, served in a souvenir coconut monkey. For appetizers, order a sampling for the table: The firecracker shrimp, tuna dip, peel-and-eat shrimp and fresh oysters were all to-die-for. For the main course, sink your teeth into the fish tacos. These were some of the best I’ve had. They feature fried fish (the catch of the day) served in a warm tortilla, and topped with coleslaw tossed in chili lime sauce, a corn-jalapeno relish and cilantro sour cream. Yum! Or, if you choose to take a charter boat for some fishing in Destin (billed as “The World’s Luckiest Fishing Village”), then AJ’s will cook your catch! Oh, and on a side note, AJ’s stays open til 4am (when the open-air upstairs bar turns into a nightclub). Also of note, AJ’s is a historical jewel, with a dining room that doubles as a vault filled with photos of fishermen past and local artifacts of Destin’s heritage. Yet another lunch spot with incredible views is Anglers Beachside Bar and Grill, located in Fort Walton Beach. 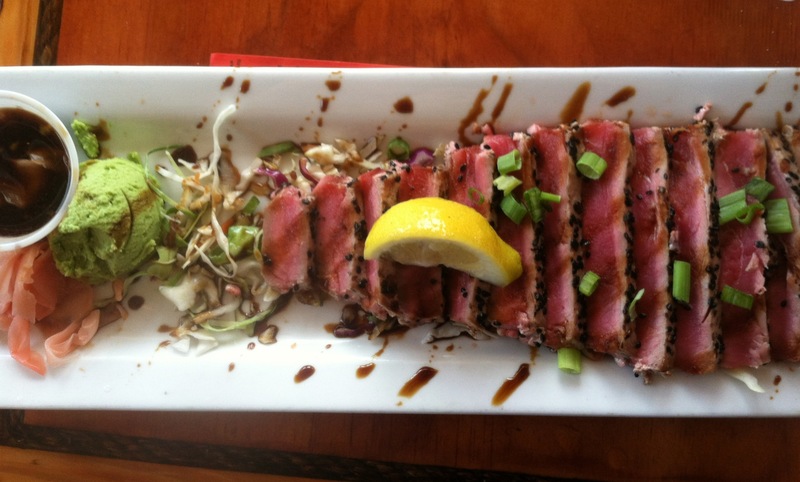 Grab a spot on the large covered deck overlooking the Gulf, and be sure to order the seared tuna. It comes sashimi style, crusted in sesame seeds and black pepper, chilled over Asian slaw, with pickled ginger, wasabi and soy sauce for dipping. This could easily be my favorite dish of the trip! Side note: This resto is located at the entrance of the Okaloosa Island Pier, which is a great spot to try your hand at fishing—less than $20 grants you admission to the pier, plus rental of all the essential fishing gear (no license required). Get in some serious me time at The Spa at Emerald Grande at HarborWalk Village in Destin. While the hotel is located in the middle of the action, the spa is a nice respite from the hustle and bustle of the village. Here, you’ll find everything from massages, facials, body treatments, wraps and masks, plus a steam room and relaxation room with chaise lounges that overlook the Gulf. My custom facial left me glowing and refreshed, and my esthetician, Melissa, couldn’t have been better. 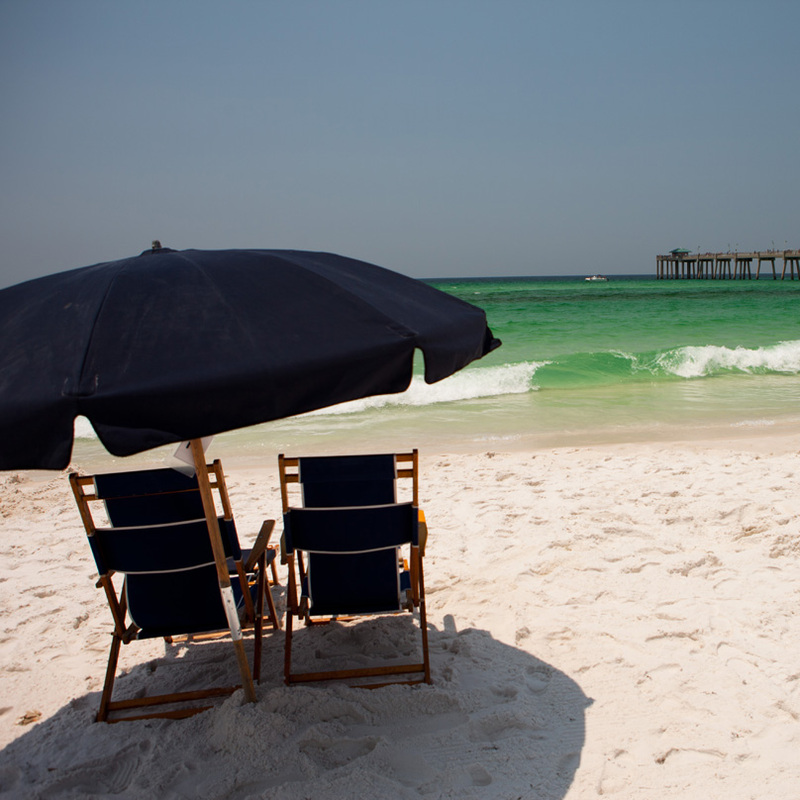 As with most places on the Emerald Coast, it comes with a beautiful view. 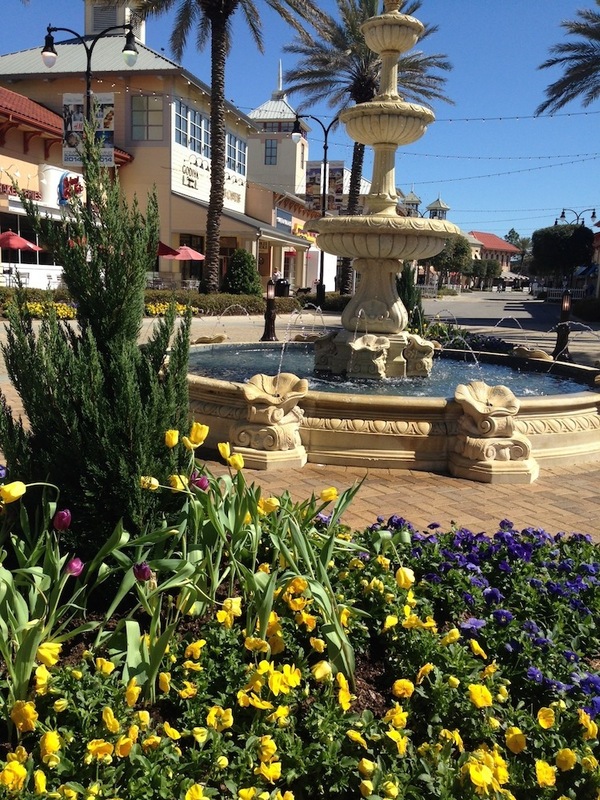 Destin Commons is an open-air lifestyle center that features more than 75 specialty stores, and casual and fine dining restaurants—including Abercrombie & Fitch, H&M, Forever 21, LOFT, Sephora, Williams-Sonoma and many more. It’s the perfect cure for some retail therapy, and it’s a great option after spending the day on the beach. While a shopping center typically might not top a list of destination hot spots, this is one that attracts 11 million visitors per year. Uncle Buck’s Fishbowl & Grill offers a bowling experience like none other. Also located at Destin Commons is the brand new bowling alley, Uncle Buck’s Fishbowl & Grill. 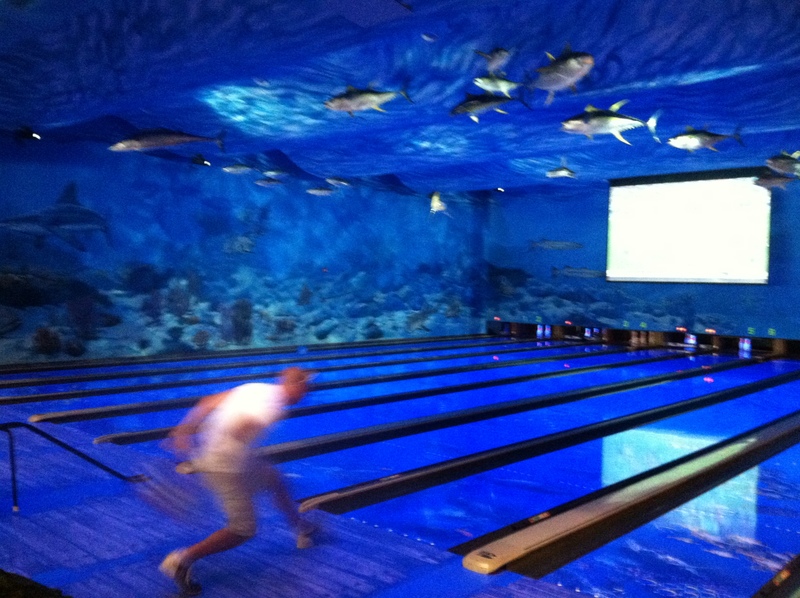 Unlike any bowling alley I’ve ever seen before, it combines a unique, underwater bowling experience with upscale dining. Looking up, down and all around, you’ll notice an immersive underwater environment, filled with hand-painted wall murals and hand-carved sculptures of fish that are indigenous to the area. Even the bowling balls themselves feature artwork of octopus, sharks, mermaids and more. For appetizers, I suggest trying the crispy calamari, the mozzarella logs and/or the warm herbed bruschetta. For entrees, try the Margherita flatbread or the famous Islamorada fish sandwich. Pretty much everything on the menu will exceed your expectations. 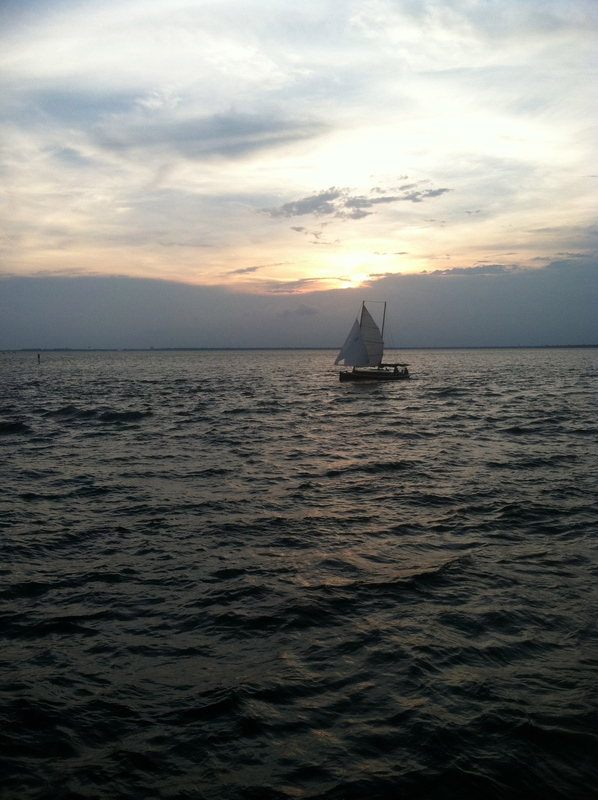 A view of the sunset from Southern Star Dolphin Cruises’ 80-foot boat. Experience the gorgeous surrounds while out on the water aboard Southern Star Dolphin Cruises’ 80-foot, glass-bottom boat. While boat tours are plentiful in the area, this one is particularly comprehensive. 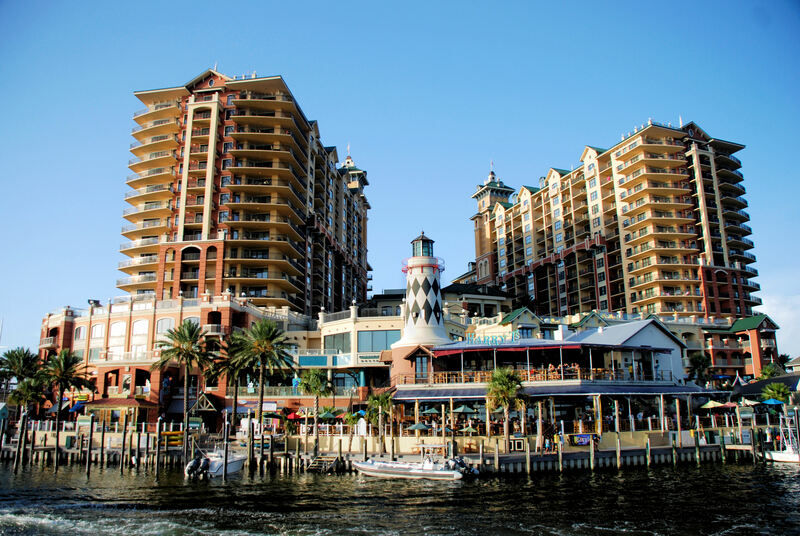 The two-hour cruise departs from Destin Harbor, and tours the entrace of the Gulf as well as the Choctawhatchee Bay. You’re welcome to bring a cocktail on board; the boat also features a snack bar, an energetic captain who narrates during the tour and plenty of dolphin sitings. And for those of you looking to have your quintessential Titanic moment, the bow of the boat provides the perfect setting. On the night that I went, I caught the sun setting and the moon rising at the same time—gorgeous! Dinner options abound in the Destin/Fort Walton Beach area, but one to try is The Black Pearl. Located directly on the Gulf, in the Boardwalk complex on Okaloosa Island between Destin and Fort Walton Beach, this casual-yet-elegant resto serves up wood-fired seafood, aged prime beef and whole Maine lobsters, paired with an extensive wine list and some of the best martinis to be found in the area. For starters, try the mussels or the lobster flatbread, and, for entrees, try the blackened grouper ceviche or the house-made lobster ravioli. For a truly elevated dining experience, book at table at Jackacuda’s, located at Harborwalk Village. Perched at one of the outdoor dining tables, you’ll have a great view of the harbor. But don’t let the relaxing atmosphere fool you—the food here is impeccable, with a menu that offers a unique and creative spin on the common local cuisine . The yellowtail ceviche balls make for a great appetizer, and the surf and turf sushi bowl satisfied both my appetite and my palate. Don’t leave without ordering the flourless chocolate cake. My group nearly came to a brawl over the last few bites—something rare for a gluten-free dessert. And, like many places in Destin, Jackacuda’s participates in Fish Trax Marketplace (a program that provides details on when, where and by whom the seafood in your meal was caught). 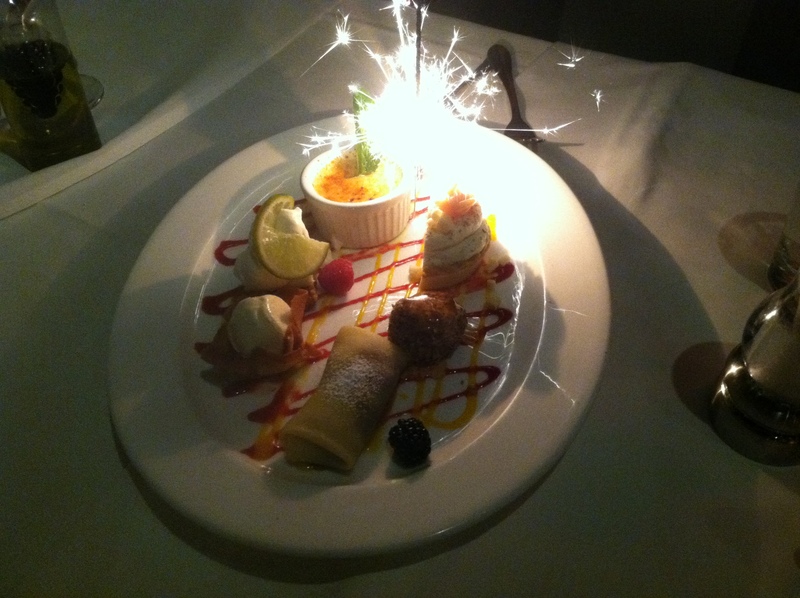 The dessert sampler at Cuvee Bistro—try them all! Make a reservation at Cuvee Bistro—a Wine Spectator Award of Excellence-winning restaurant. Located in Destin, this fine-dining restaurant—helmed by Chef Tim Creehan (who catered Amy Grant and Vince Gill’s wedding)—offers a blend of classic French, Asian and Italian cuisine. If you don’t eat anything else on your trip, be sure to try the smoked tomato and shrimp soup. It was so good that I would have licked my bowl (in private, of course!). For an entrée, try the oven-roasted Chilean sea bass, served with avocado citrus vinaigrette and basmati rice, for a truly mouth-watering meal. And be sure to save room for dessert. I recommend pairing the chocolate sin cake with the Stressless Martini; that way, all of your bases are covered. Or, if you can’t decide between the vanilla crème brulee with fresh berries or the Key West lime pie with fresh cream, then order the dessert sampler for a taste of six miniature desserts. Overall, this is a great restaurant, and it offers the chance to change out of your beachwear and into your dapper duds. And of course, be sure to rent a dedicated beach chair (complete with umbrella) at any number of resorts along the coast. This is a more convenient option as compared to the general beach-chair rental companies. A few to try in Fort Walton include Azure Condominiums, Four Points Sheraton and Ramada Plaza Beach Resort. Tip: If the beach chairs are booked, come back in the afternoon. Many previously reserved chairs will have opened up, and you’ll possibly get a discounted rate. Excellent inisght with extremely valuable tips!